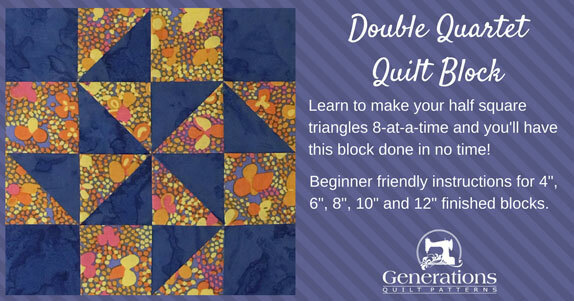 The Double Quartet is the perfect place to use our 8-at-a-time half square triangle technique! It saves a couple of steps from the traditional method. They come out perfect every time. 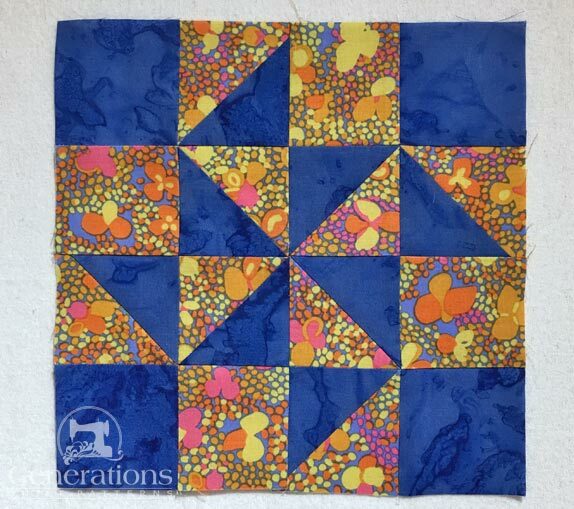 And when your HST are perfect, your block is a breeze to put together! 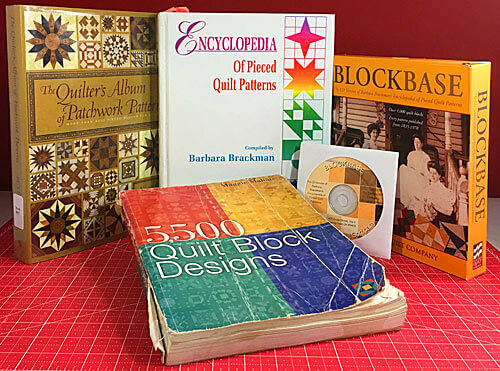 It's to to cut up and sew. On the double! Then press the SAs as instructed. 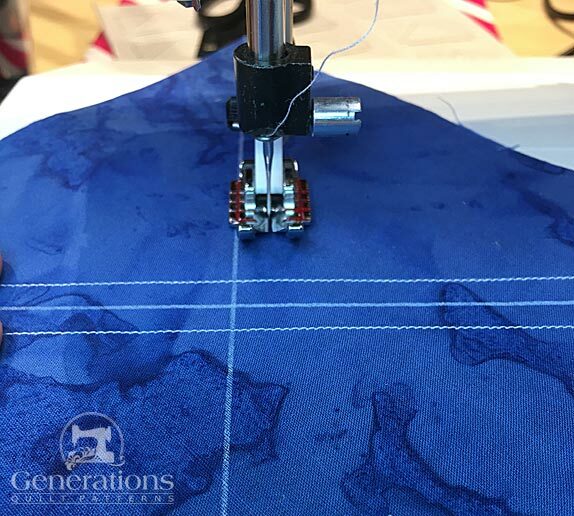 I prefer to use starched quilt fabric for cutting and sewing accuracy—mixing StaFlo Liquid Starch concentrate with water in a 50/50 mixture. You'll need two fabrics with good contrast. 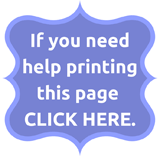 If you're using a print, be sure that the scale fits the block size you've chosen. 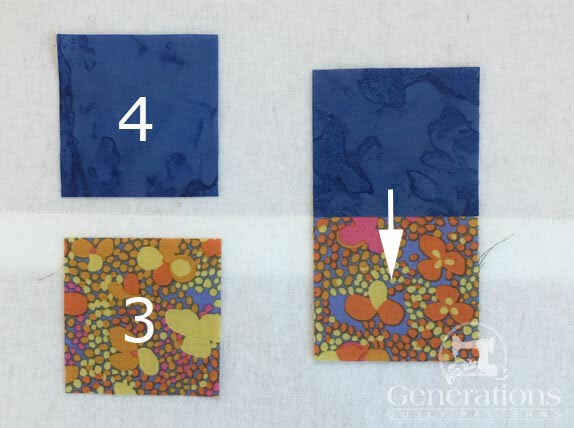 To avoid the look of 'missing points' it helps to use a contrasting fabric in a color that isn't in the print. 1	 L	 1	 4¼"	x	4¼"	 5¼"	x	5¼"	 6¼"	x	6¼"	 7¼"	x	7¼"	 8¼"	x	8¼"
2	 D 1	 4¼"	x	4¼"	 5¼"	x	5¼"	 6¼"	x	6¼"	 7¼"	x	7¼"	 8¼"	x	8¼"
3	 L	 4	 1½"	x	1½"	 2" x	2" 2½"	x	2½"	 3"	x	3"	 3½"	x	3½"
4	 D 4	 1½"	x	1½"	 2" x	2" 2½"	x	2½"	 3"	x	3"	 3½"	x	3½"
Unfinished Block Size	 4½"	 6½"	 8"	 10½"	 12"
Grid Size	 1"	 1½"	 2"	 2½"	 3"
If you plan to make many blocks, you may want to use another HST method like triangle paper for even more efficient piecing. 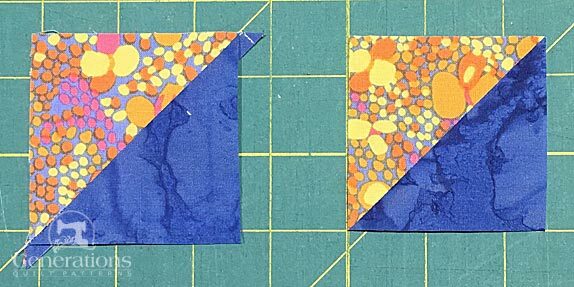 On the backside of either the #1 or #2 square (whichever one is easier to see the marking on) mark a diagonal line from each pair of corners. On the sample I've marked the darker #2 with my favorite marking tool—the Bohin Mechanical Chalk pencil (with white chalk 'lead'). 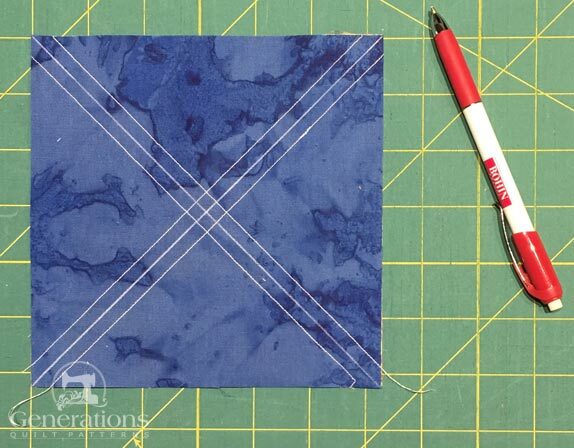 Sew a quarter inch away from both sides of the each of the lines for a total of four lines of stitching. I like this version of a quarter inch foot —the one with all the markings on it—for this part. Give the sewn #1/#2 a press. That's the Bohin marking pencil on the right. 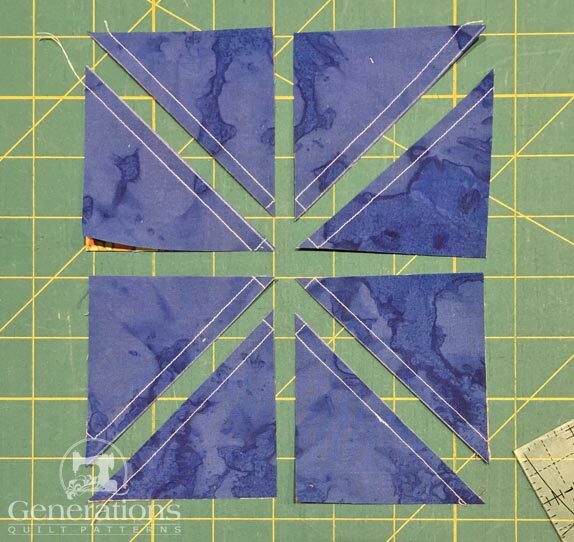 Now we need to cut this square into 8 HSTs. Use the chart below to find the Center Measurement that corresponds to the Finished Size you choose. For our 8" sample, the Center Measurement is 3-1/8". I like to use a rotating rotary mat for this next bit of cutting. There's less chance of disturbing the patches for the second cut. Align that center Measurement mark on your ruler with the edge of your #1/#2. 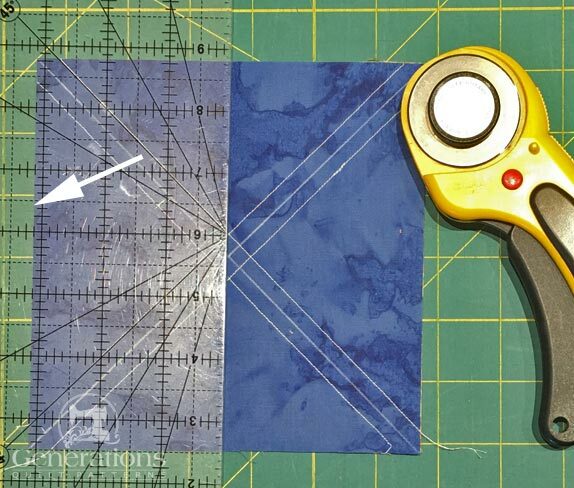 The edge of the ruler should go right through the center of your patches. 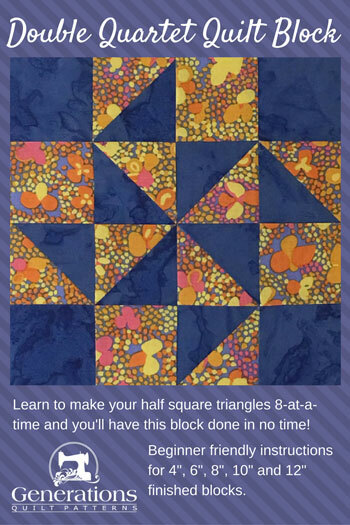 Rotate your mat a quarter turn, align the center measurement with the edge of your block, cut through the center again. At this point you have four equal squares. To finish the job, cut each in half along the chalk line. Press each with the SA toward the darker #4 patch. Referring back to the chart above, find the 'Trim HST to...' measurement. For the 8" sample, they are trimmed to 2-1/2". 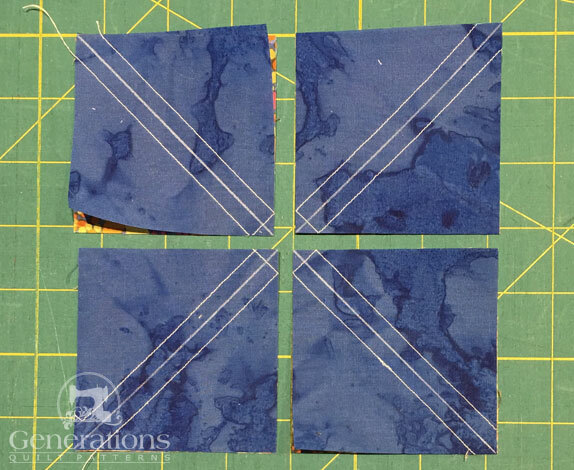 After all 8 are trimmed, sew them into pairs as shown below. The SAs nest. That makes getting a good match at the points much easier. Press the SA in the direction of the white arrow. 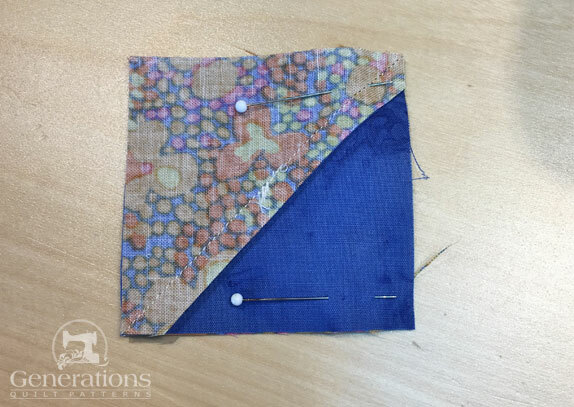 With RST, sew a #3 to a #4 patch. 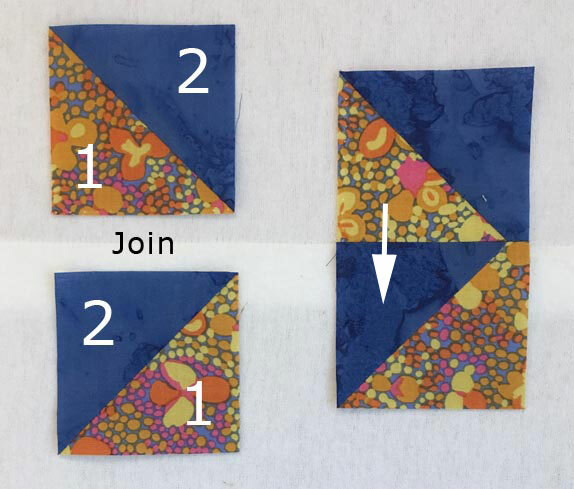 With RST, stitch a pair of HST to a pair of squares. As usual, I like to pin to ensure pointy points where they matter. To complete the units we'll twirl the seams. The twirled seams create a reverse image of the unit on the backside. Twirling these seams means that all the SA will nest together. 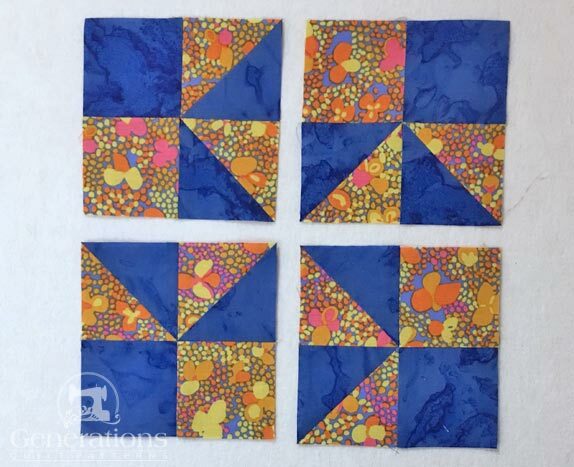 Arrange the four quarters into the Double Quartet design. A solid, dark #4 square is in each corner. A pinwheel forms in the center. Because we took the time to twirl our SA, no matter how the units are arranged, all the SA will nest. Stitch the two units in each row together, pinning as needed. 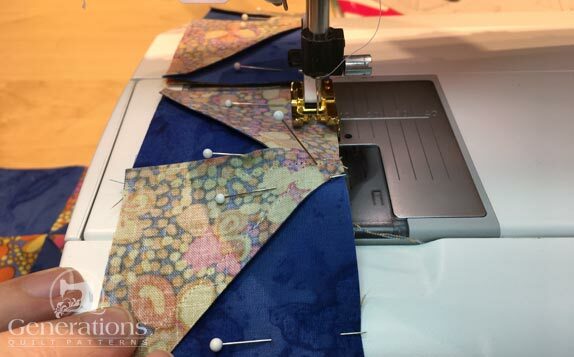 SA are pressed in opposite directions so they will nest for the final seam. Finally, join the two halves RST. 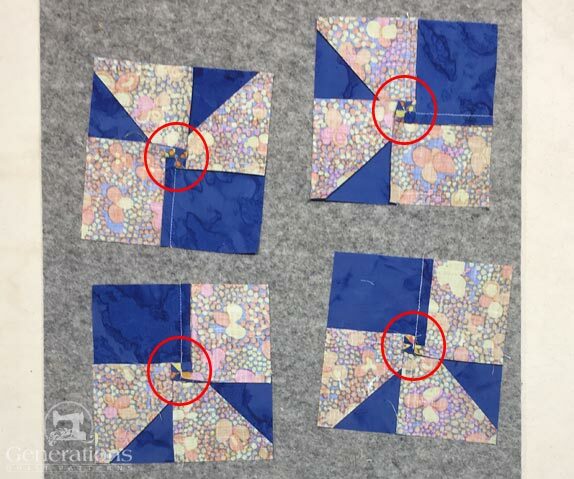 Pin to get a good match in the center of the pinwheel. If you need a quick refresher on getting perfect points, click here. 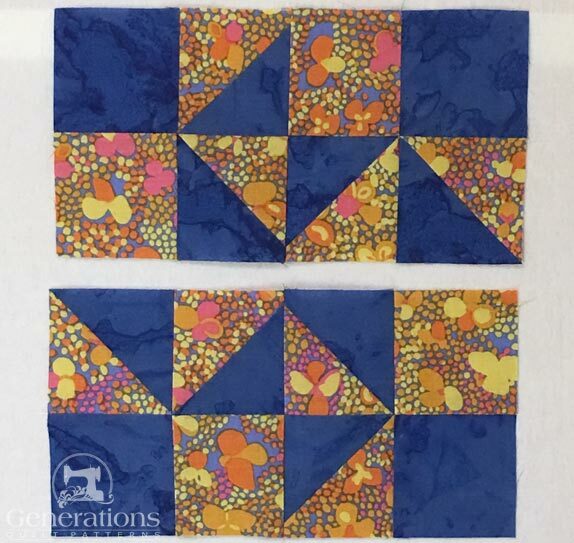 After stitching, give your block on final press (try my favorite pressing technique for a really flat block) and it's ready for a quilt!